A lot of people feel that 2016 was a terrible year, largely because of the Brexit referendum, Donald Trump, and the untimely deaths of several celebrities. Some of my friends also had personal sorrow and loss. I do not wish to downplay the bad stuff in the world, and I think we should think hard about how to make 2017 better. In the spirit of making 2017 awesome, I’m going to post about things in which I delight every once in a while. Whenever the fancy strikes me, about whatever thing that grabs me. This is an early second-century mosaic of doves from Hadrian’s villa at Tivoli, now in the Capitoline Museum in Rome. 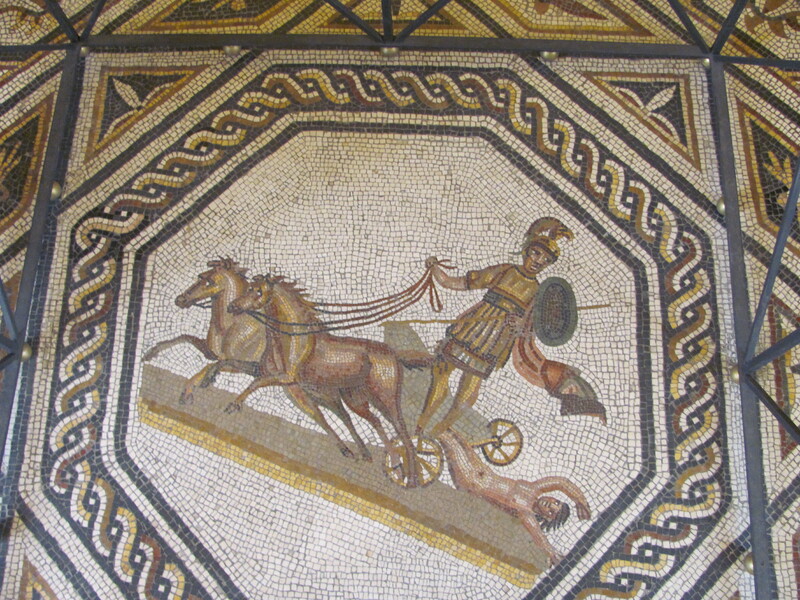 The tesserae (the little bits of glass/tile/stone used to make a mosaic) are very, very tiny, often only a few millimetres in length. From a distance, it can be mistaken for a painting, so fine is the handiwork. They have a particular aesthetic that other forms of art do not have. Now, I like other visual arts, other media of beauty. Maybe I’ll share some stained glass one day soon. Each has its own particular way of displaying beauty. 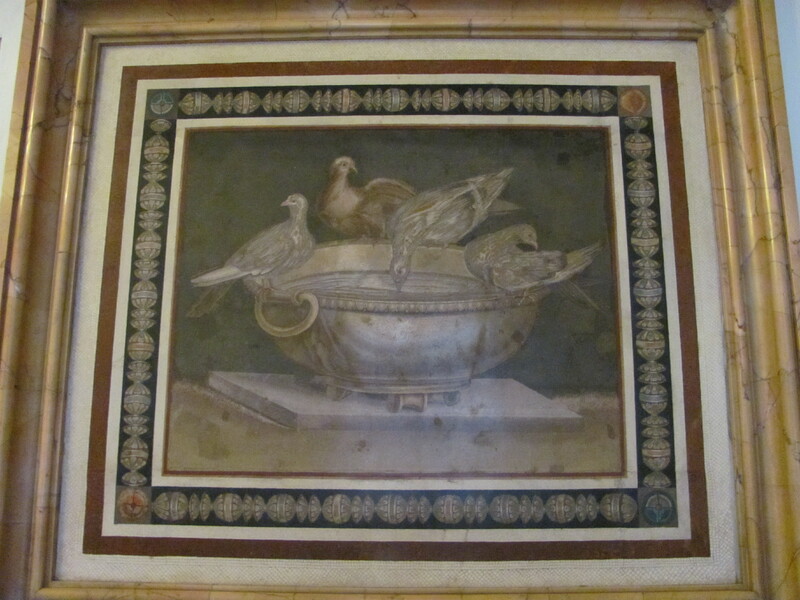 Few mosaics look quite as much like a painting as the doves above (although there is only one painting in San Peter’s, Rome!). The bringing together of many small items, each unique, to create a larger whole, results in a different feel. I’m not very good at writing about art, so let’s just move on to the pictures. 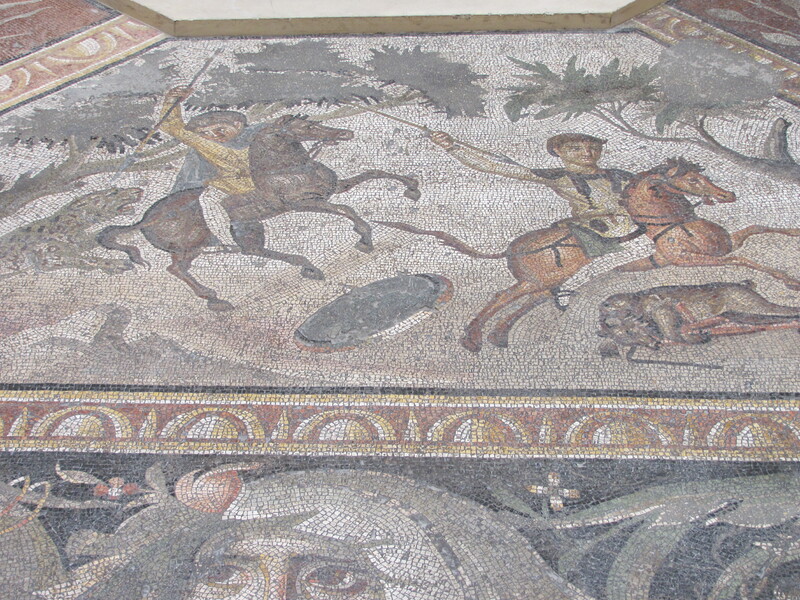 If you want a set of 105 mosaic photos, I’ve got one of those on Flickr. 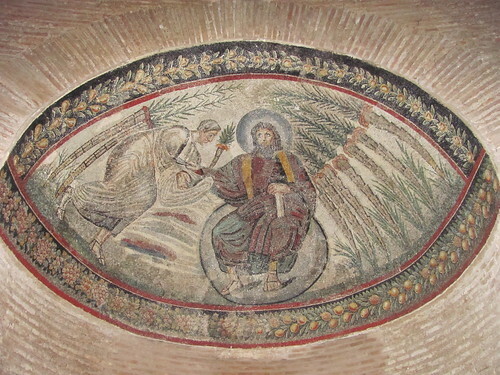 This one is part of the Mosaics of the Seasons, c. 225, from Daphne a suburb of Antioch (modern Antakya, Turkey). 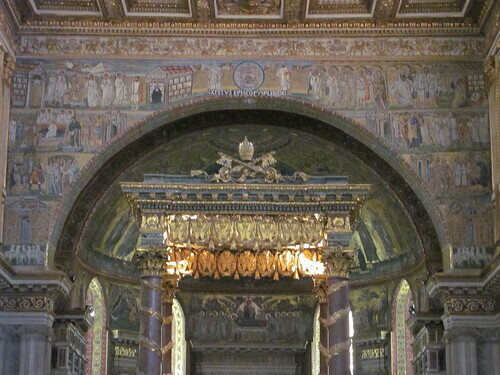 This is a vaguely blurry image of half the triumphal arch at Santa Maria Maggiore as well as some of the apsidal dome. 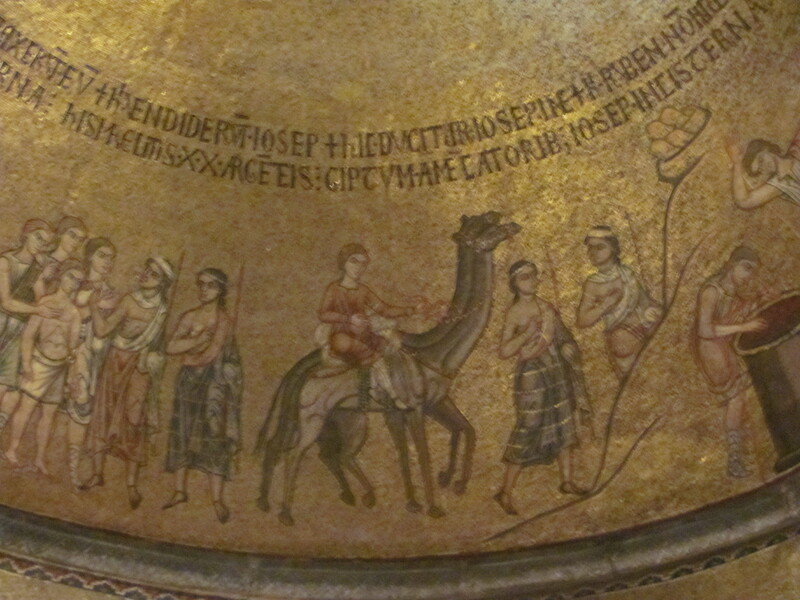 The mosaic on the arch dates to the papacy of Xystus III (432-440). 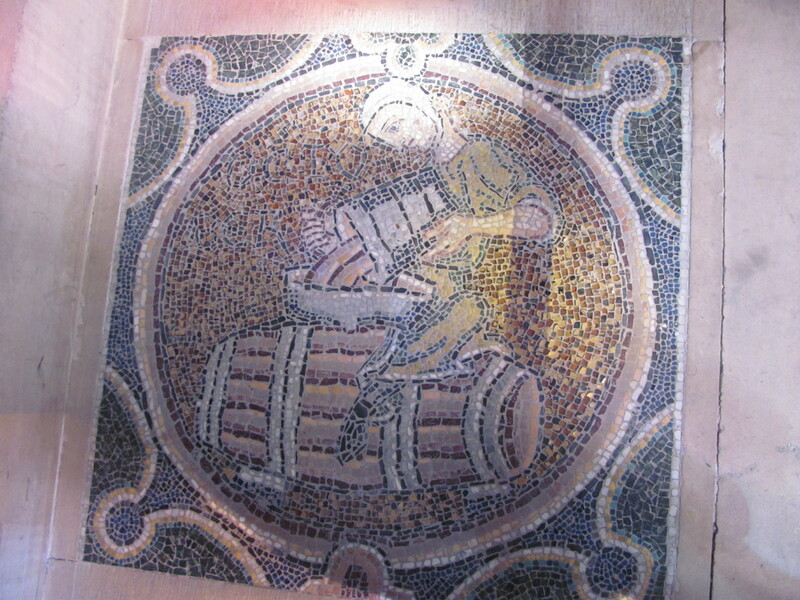 At the bottom is Jerusalem (parallelled by Bethlehem on the right side of the mosaic. 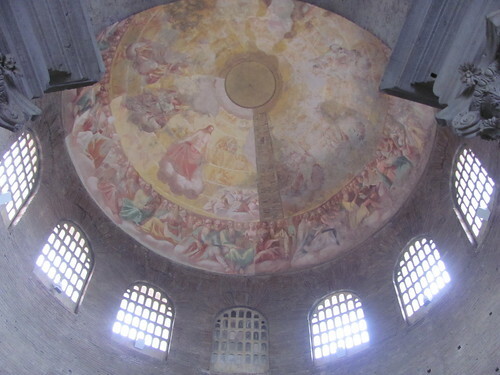 Above it we see stories from Jesus’ life, such as the massacre of the innocents, Jesus in the Temple as a boy, and an event at the top that I can’t place. 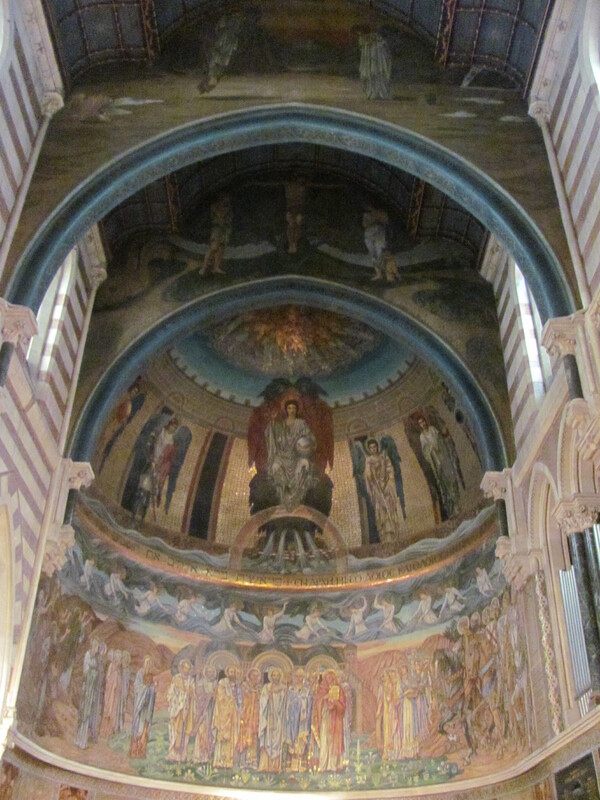 The glistening gold of the apse is 13th-century and features the Coronation of the Virgin; all of my photos of it are extraordinarily blurry. 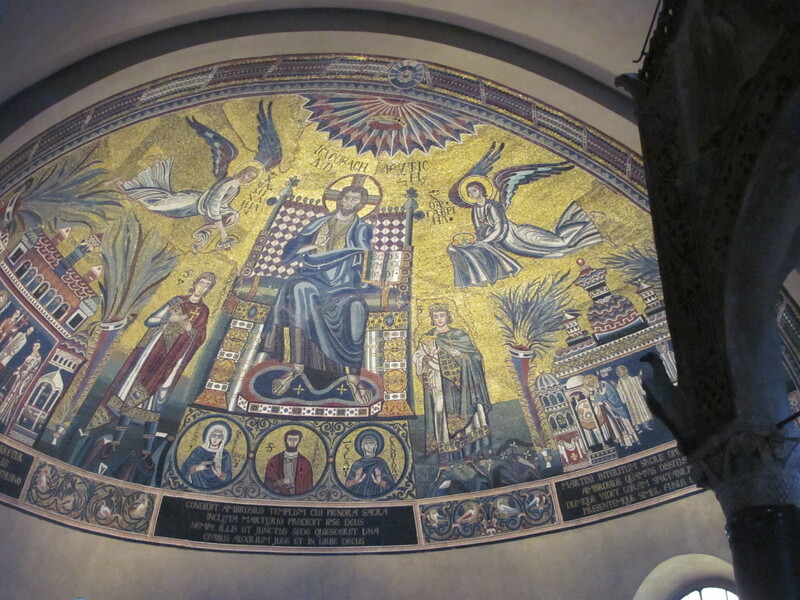 This 11th-century mosaic is on the apse of the Basilica di Sant’Ambrogio in Milan. Christ, throned in glory, is flanked by angels. 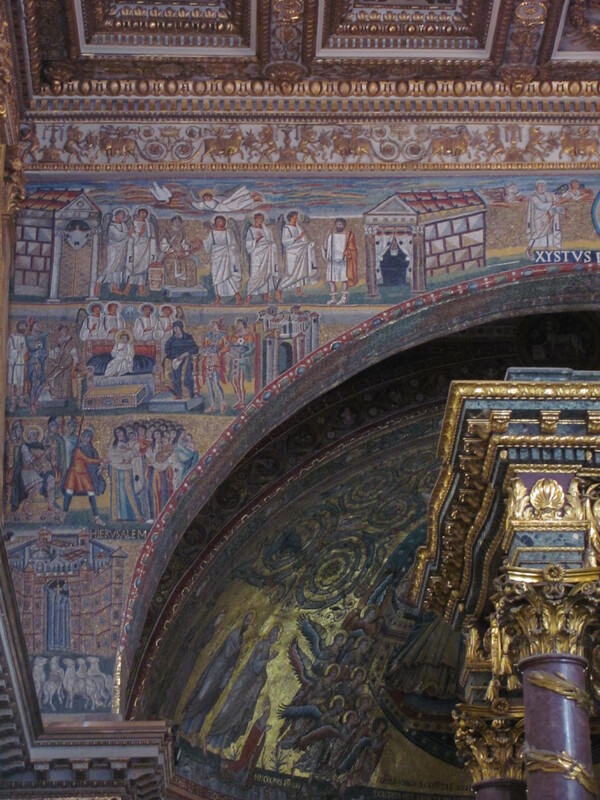 In the lower corners of the semi-dome you can see some of St Ambrose’s miracles. 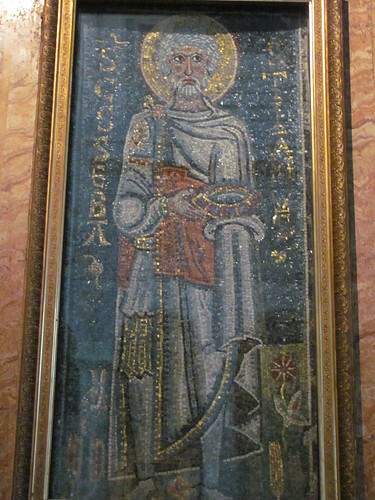 Speaking of St Ambrose, here is my rather lacklustre attempt at a photo of the fifth-century mosaic in the side chapel of San Vittore in the same basilica. As with many 19th-c images I love, this (sadly, blurry photo) is Pre-Raphaelite — Edward Burne-Jones. I think I’ll end here. Sorry that some of these are blurry. 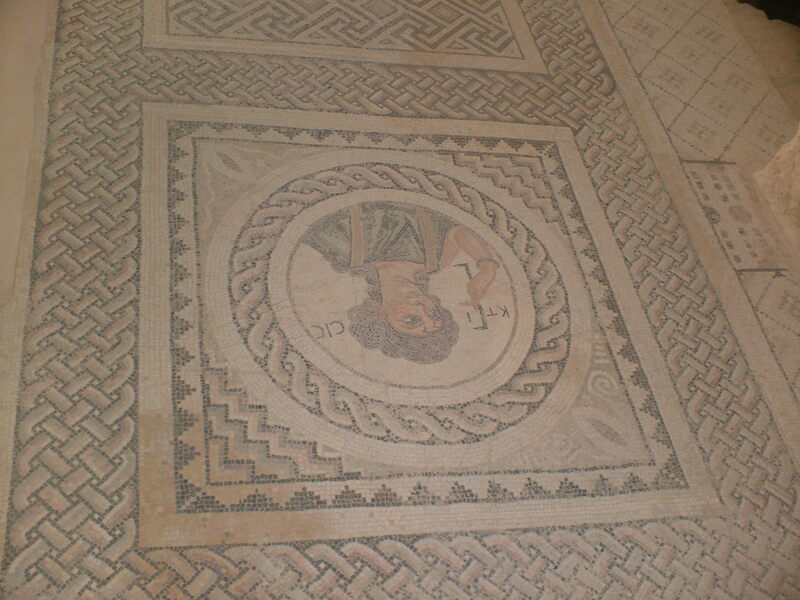 I do like a mosaic, though! This entry was posted in Ancient World, Art, Christianity, Classics, Mediaeval and tagged basilica sant'ambrogio, kourion, louvre, mosaics, saint paul's within the walls, san marco, san paolo fuori le mura, santa maria maggiore, santa prassede, st denis, vatican museum on January 20, 2017 by MJH. 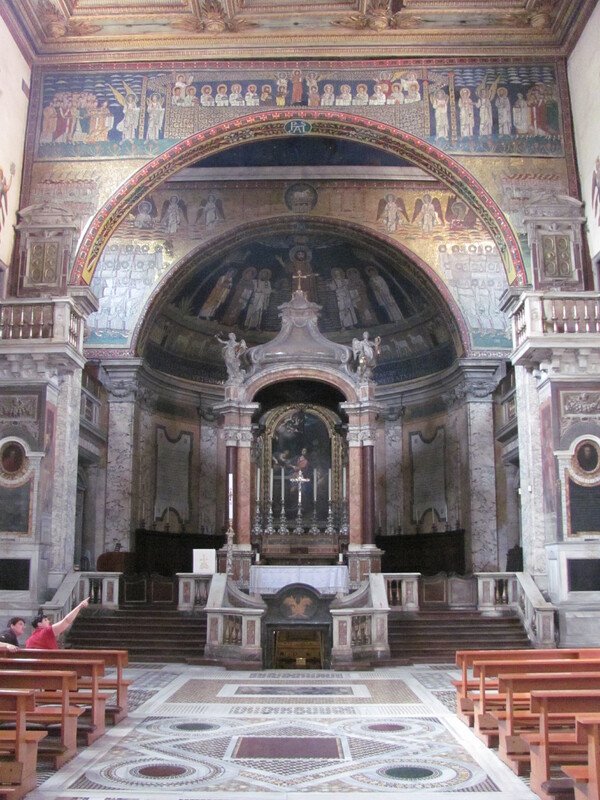 Santa Maria Maggiore, competing visually with the Colosseum? Growing up in Rocky Mountain House, Alberta, and then Thunder Bay, Ontario, I had this idea that the history of the arts was neatly compartmentalised. After mediaeval stuff, there was Renaissance, then Baroque, then Classical, then Romantic. (Which is where music history should maybe end?) My first clue that this was not so cut-and-dry was when I learned that Beethoven, although ‘Classical’ is, in certain respects, drawing us into the Romantic. When we think about visual art, it’s pretty much the same. People didn’t stop building Romanesque churches just because Gothic had come around. Gothic-style art was not immediately engulfed by the Renaissance. And sometimes it can be hard to see where the Renaissance ends and the Baroque begins. Not only do stylistic periods overlap, but in real life they also co-exist. 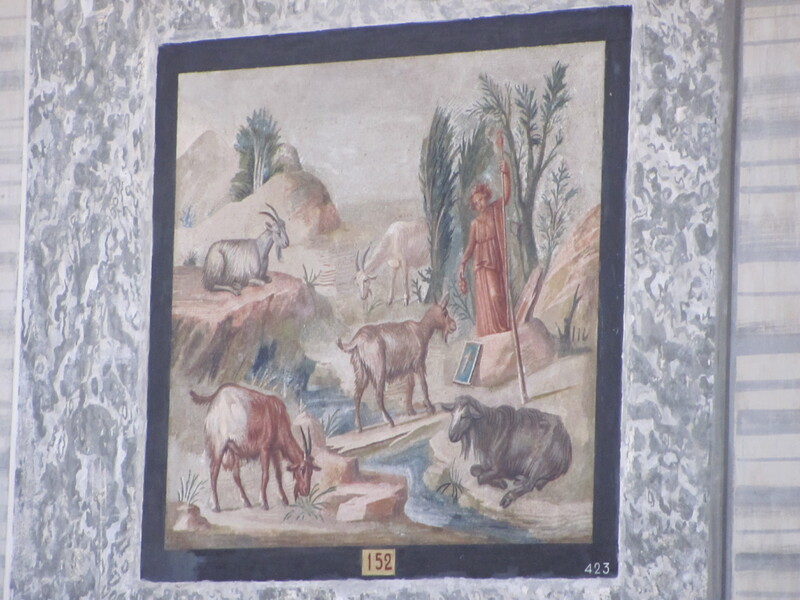 This coexistence is abundantly evident in Rome, where the same church might house ancient columns, Late Antique mosaics, mediaeval mosaics and a mediaeval crucifix, as well as some Renaissance paintings and Baroque architecture and sculpture. Some places that look like the Baroque vomited all over their inside still have their wooden, mediaeval crucifices and maybe an early mediaeval Byzantine Madonna and Child. And sometimes you can find the 19th century peeking around the corner. It’s a simple point, but an important one. The visual world of a single place and period is not restricted to its historical moment. The Colosseum is not just a Flavian monument; it persists in monumentality in Late Antiquity, in the Middle Ages, in the Renaissance, through every period of art in the Eternal City, right up until today. 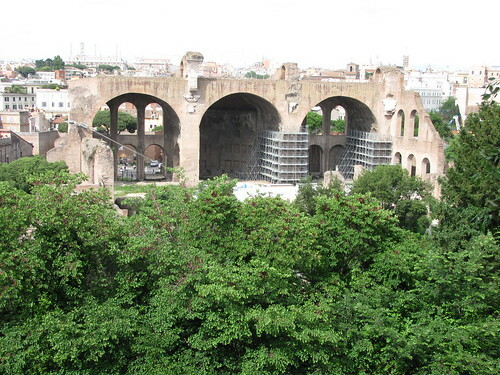 It does not cease to be part of the visual landscape of Rome just because modern Roman buildings are quite different. I think this simple observation is important for historians when they start to try to take into account the visual evidence of a given period. It is important to track the changes and developments peculiar to each moment, but we also need to remember what the rest of the visual world of these people was. 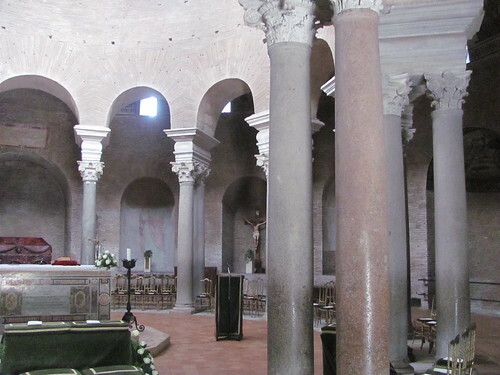 For example, fifth-century Rome is not just refurbished Constantinian basilicas. It is not just the Theodosian Mausoleum. 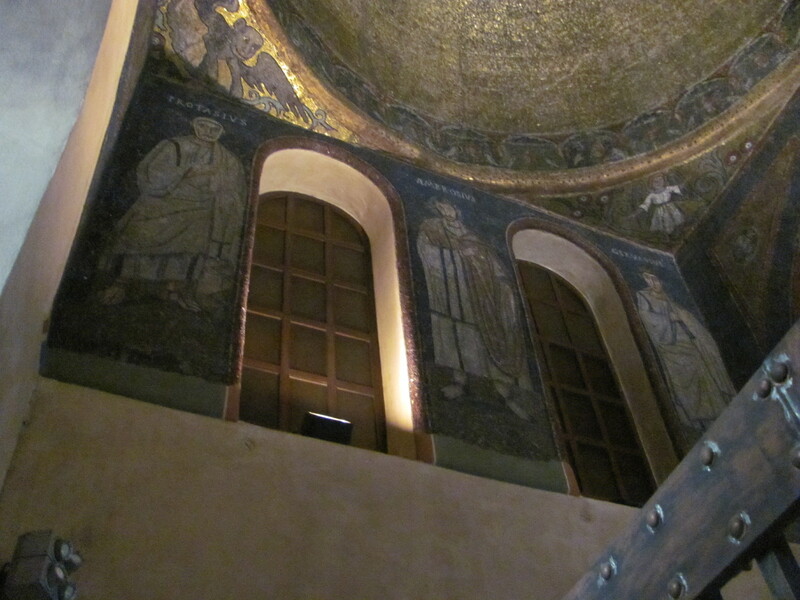 It is not just the mosaics in Santa Sabina and Santa Maria Maggiore. 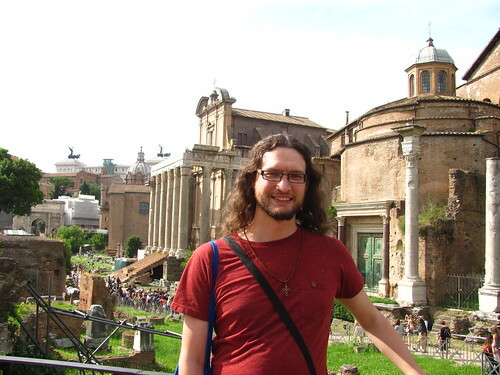 It is also the Basilica of Maxentius, the Baths of Trajan, the Ara Pacis, the Column of Trajan, the Pantheon, the Circus Maximus, the imperial residence on the Palatine. Rome in the 400s was still ancient Rome, and these secular and pagan monuments were the main visual displays for the populace of the City, including her bishops (‘popes’). 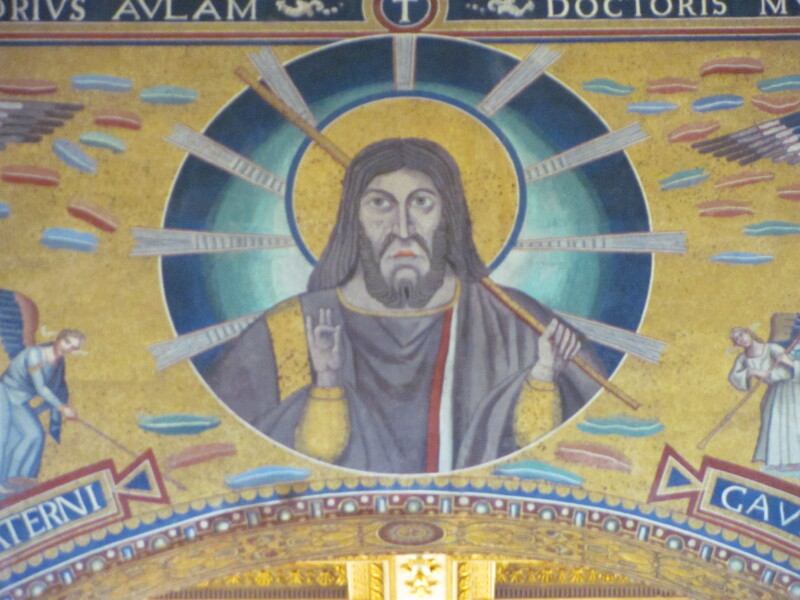 This means that when we look at the mosaics in the fifth-century basilicas, we need to ask ourselves what message Xystus III or Celestine I was sending into this world full of triumphal arches, secular military campaigns, pagan temples, altars to false gods. What does it mean? 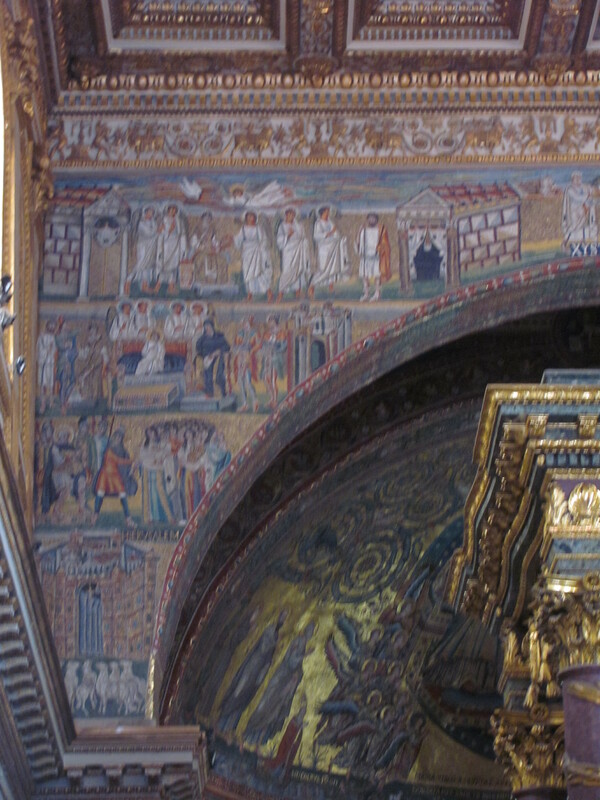 In this still-so-pagan visual world, is the drowning of the Egyptians in the Red Sea up on the wall in Santa Maria Maggiore, alongside Joshua making the sun stand still in the sky in battle against the Amorites, or Melchizedek prefiguring Christ not making its own statement about the supremacy of Rome’s new religion and protector? Finally, I think that this Classical visual culture will still have had its effect upon the Christians as they started to make themselves visible in the public spaces of Rome, or in their sarcophagi. I think it would be unavoidable, living right alongside the Arch of Septimius Severus and the Column of Marcus Aurelius, let alone the Classical sarcophagi along the roads in and out of the City. These are thoughts that could be considered for any city and any time. What did it look like to them? What else was there besides what was new? How might this have influenced them? Did it affect Tallis to write Renaissance music for singing in Gothic churches? Who knows? We never will if we don’t ask. 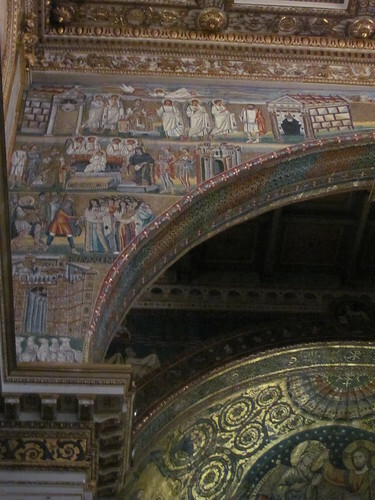 This entry was posted in Ancient World, Art, Christianity, Classics, History, Patristics and tagged art history, historiography, mosaics, roman art, rome, santa maria maggiore on November 5, 2015 by MJH. The Mausoleo di Santa Costanza, as discussed here, was not the only Late Antique building I found on my hunt through Rome. On the day I visited Santa Costanza, I also visited several basilicas and the Baths of Diocletian — not to mention a variety of artefacts on display in the Museo Nazionale Romano. Now for basilicas. 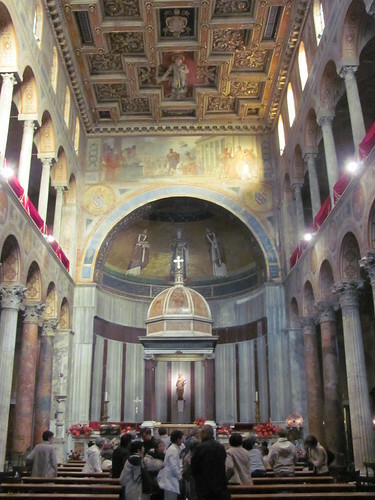 When we think of basilicas today, we immediately think of St Peter’s in Rome or Sacré Coeur in Paris; that sort of basilica, especially the latter, is not so much an architectural term any more as it is a special type of church that has a special papal blessing, if memory serves me right. However, our earliest Christian basilicas are not of that sort. The architectural origins of the Christian basilica, as with so much other early Christian art and architecture, are classical. (The argument about alleged pagan tainting of Christianity can be had over at this blog, not here.) 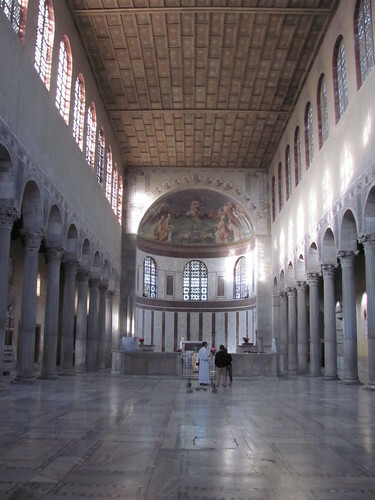 A basilica is a big, public building in the Roman world. They served many functions — social, economic, judicial. Stuff went down in basilicas. 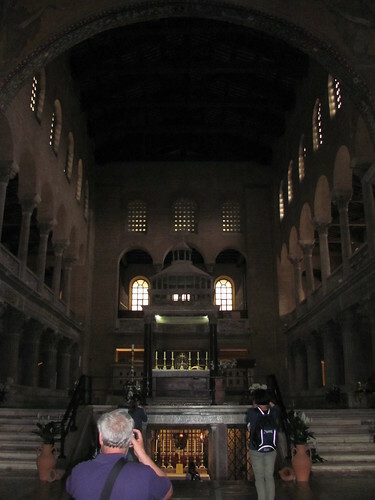 The earliest named basilica is the Basilica Porcia, mentioned by Livy as being built by Cato the Elder in 184 BC. 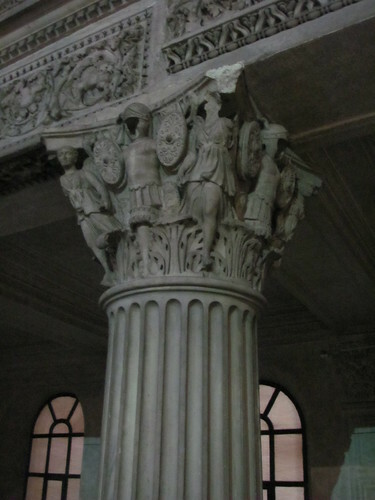 People kept building them for everyday, secular purposes throughout antiquity; there is one that served basically as a throne room at Trier, the Aula Palatina, and the giant remains of the Basilica Nova of Constantine and Maxentius are a very prominent feature of the Roman Forum today. When Constantine made Christianity definitively legal ca 312/3, Christian basilicas started popping up as places for public worship. 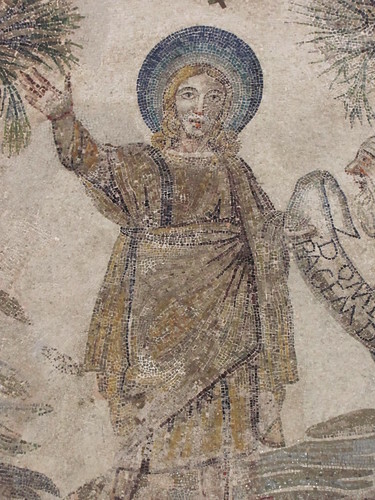 The basilica at Tyre, for example, opened in the year 316 with a homily by Eusebius — and from as early as that Christian theology of space and buildings was already infusing what went on in basilicas. The city of Rome is filled with basilicas, popping up all over the place. They started with St John’s Lateran — of which basilica (not counting the baptistery next door) nothing ancient remains, although the current Renaissance building is striking — and continued being built throughout the Late Antique and Early Mediaeval worlds. For this reason we all look towards the East in our prayers, though there are few who know that it is because we are in search of our ancient fatherland, Paradise, which God planted towards the East. We fulfil our prayers standing upright on the first day of the week, but not all know the reason for this. –De Spiritu sancto 66, quoted by Andrew Louth in ‘Experiencing the Liturgy in Byzantium’, p. 83. Louth, in the essay wherein the Basil quotation is found, observes that facing East is as old as our records of Christian worship can take us. 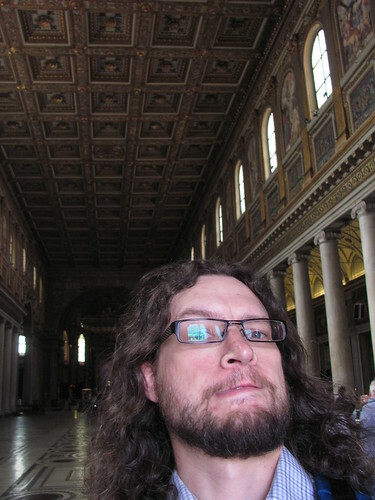 I like Sant’Agnese. We see in this church beautiful, Late Antique mosaics as well as the late ancient innovation of placing arches directly on top of columns. 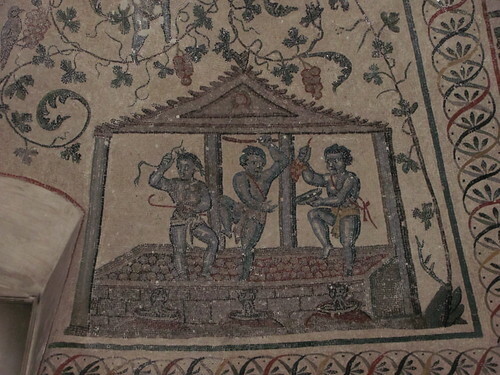 Most of the decoration, save the mosaic, is later, but the effect is undoubtedly much the same as it would have been in the 600s. My next basilica took me back further in time to the mid-400s (my playing field!). This was San Pietro in Vincoli. 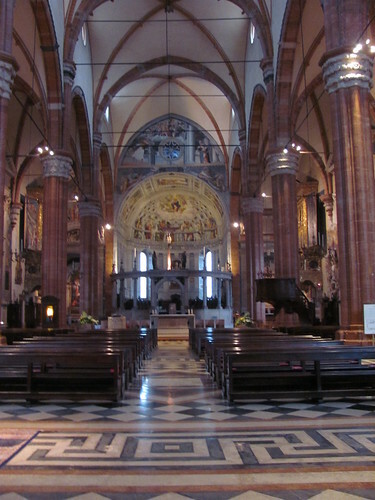 The fabric of the basilica is essentially fifth-century. 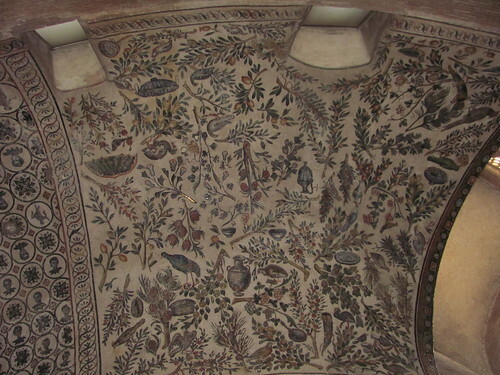 However, none of the ancient decoration is left, and there is a lot of Renaissance embellishment in the way. 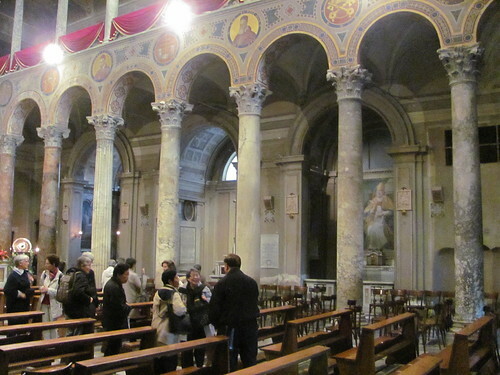 Nonetheless, San Pietro in Vincoli is much wider, brighter, and airier than Sant’Agnese. This is the sort of space a newly-relocated imperial court or an ascending papacy would like to show off. From San Pietro in Vincoli, I took a trip to Santa Maria Maggiore. 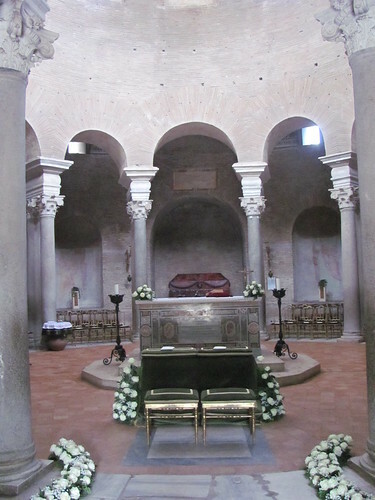 This basilica dates from the fifth century as well, prior to the papacy of Leo. 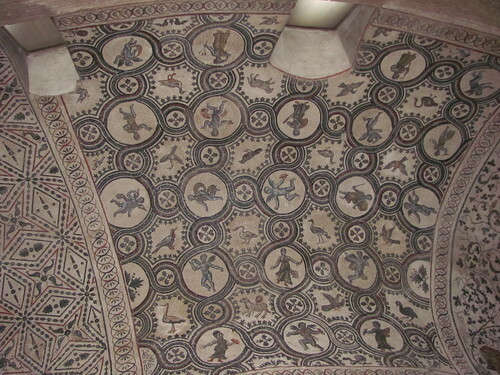 The apsidal mosaics, stunning as they are, date from 1294. 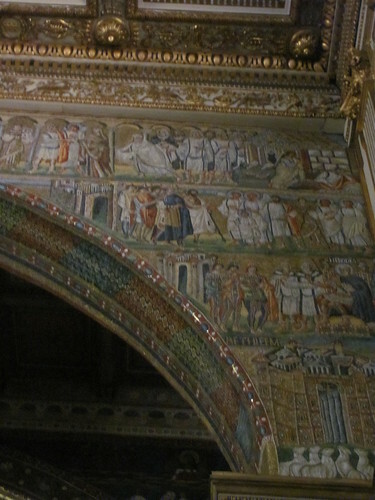 However, the triumphal arch segmenting the apse from the nave sports fifth-century mosaics, and the series of mosaics running along the nave above the columns are also fifth-century originals, sporting scenes from the Old Testament. These are the four Late Antique basilicas I saw that day in April — two fifth-century, one sixth-century, and one seventh-century. 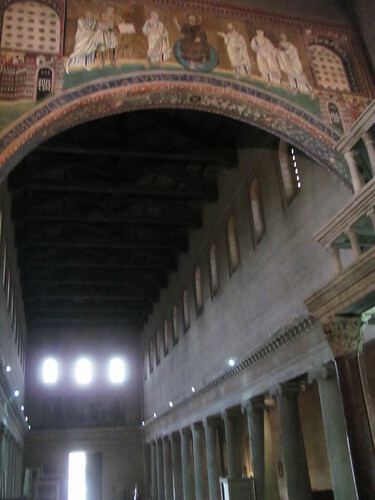 The mosaics were that Late Antique style typically called ‘Byzantine’, and they all followed the same architectural layout, a wide nave with two side aisles and an apse; all save Santa Maria Maggiore face East. 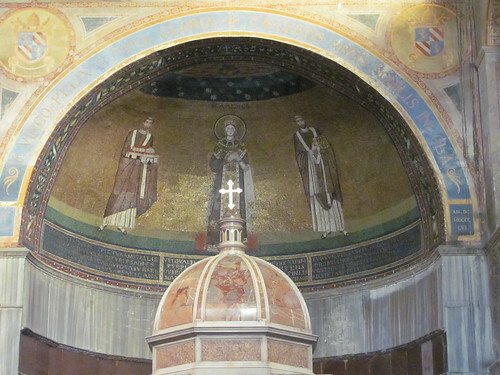 Other Late Antique basilicas of note in Rome: Santa Sabina (5th-c, stripped of Baroque accretions) and Santa Cecilia in Trastavere (4th-c, lovely 9th-c mosaics and many modern interventions). The highly traditional, ‘Byzantine’, decoration in Santa Prassede (9th-c) makes it also a basilica of note in this regard. 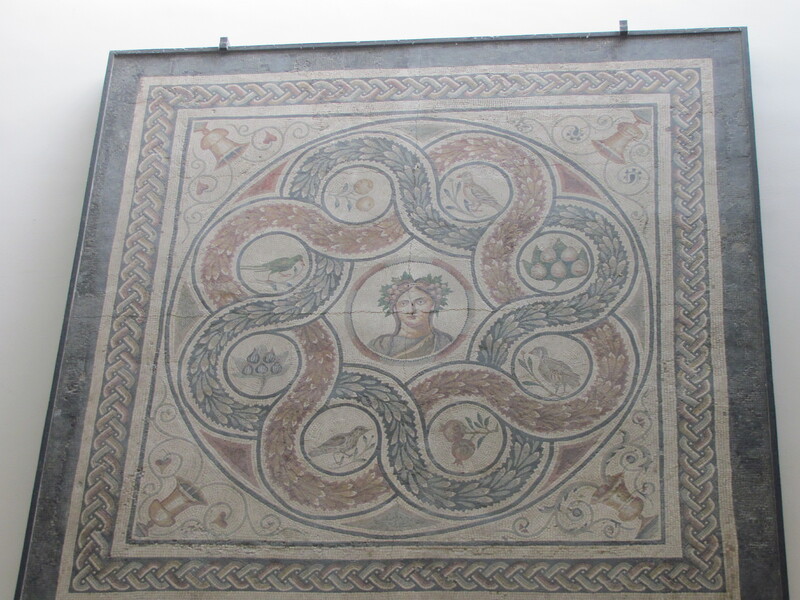 And if you really like mosaics and are going to Rome, don’t miss Santa Maria in Trastavere and San Clemente — the latter has Late-Antique-inspired, 13th-c apsidal mosaics and is on top of what’s left of a fourth-century basilica on top of a Temple of Mithras and an old Roman house. Dodge, Hazel. ‘Basilica‘, in Grove Art Online, part of Oxford Art Online, accessed 22 June, 2014. 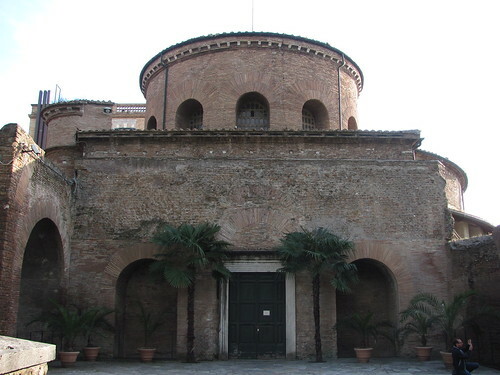 The Basilica of Santa Maria Maggiore. Booklet available for purchase at the basilica. Louth, Andrew. ‘Experiencing the Liturgy in Byzantium’, in Experiencing Byzantium, Claire Nesbitt and Mark Jackson, edd. Pp. 79-88. 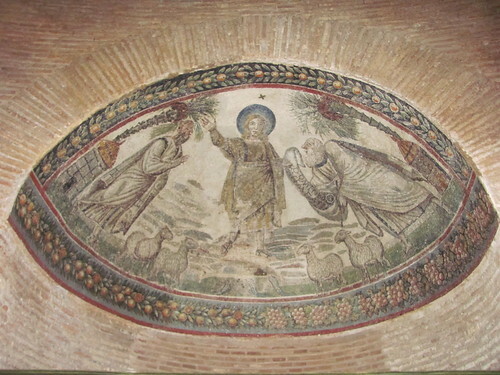 This entry was posted in Ancient World, Art, Christianity, Classics, Discover Late Antiquity, History, Mediaeval, My Travels, Patristics and tagged basilica di massenzio, basilica of maxentius, basilicas, late antique architecture, mosaics, san lorenzo fuori le mura, san pietro in vincoli, sant'agnese fuori le mura, santa maria maggiore, what is a basilica on June 22, 2014 by MJH.